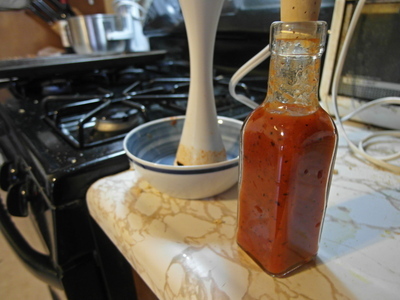 Here is a way to make hot sauce from left over hot pepper pieces/parts (seeds, pith) that would have been thrown away. I was stuffing jalapeno peppers with cream cheese to make poppers. I cut off the ends and removed the pith and seeds inside and had a pile of scraps left. This is some of the hottest parts of the pepper, but they are not as good to eat or cook because they are so hard and get stuck in your teeth. But we can extract all that spicy hotness and make a sauce with it. Chop the peppers or scraps. Chopping them up allows the heat to get into the vinegar. 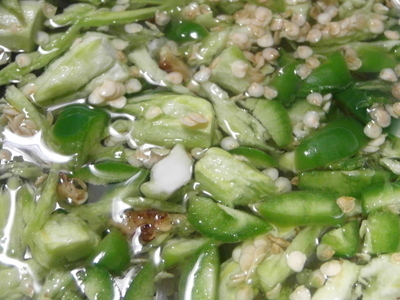 Cover the peppers with about twice their volume in vinegar. 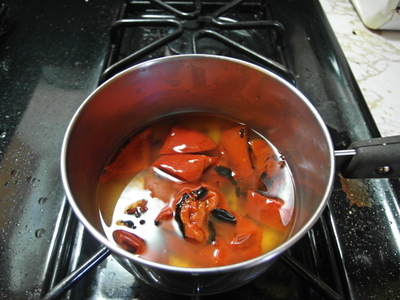 So if you have 1/2 inch of peppers in your pot, add about an inch of vinegar. This isn't exact, but isn't something that can be messed up either. Stuff you were just going to throw out! Bring to a boil and simmer 5-10 minutes. 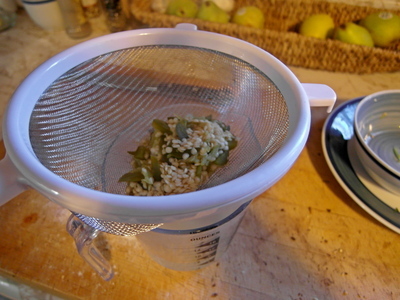 Pour through a strainer and save the vinegar infused with hot peppers. You've got heat, and perhaps a tiny bit of native flavor from the hot pepper, but this is where you pick a flavor to make it really really good. I like using a roasted red pepper. It is rich and smoky and slightly sweet; everything the jalapeno isn't, so they should pair well. 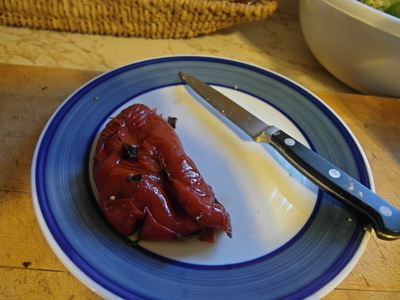 This was a home roasted pepper that I pickled in a brine and seasoning solution. Store bought is also good, but avoid ones packed in oil. 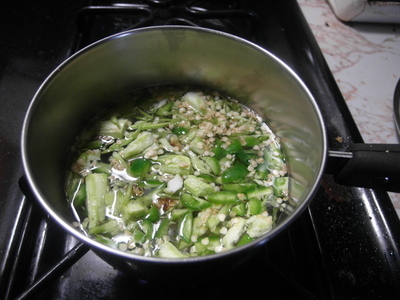 Slice it up into chunks and combine with the infused vinegar in the pot. 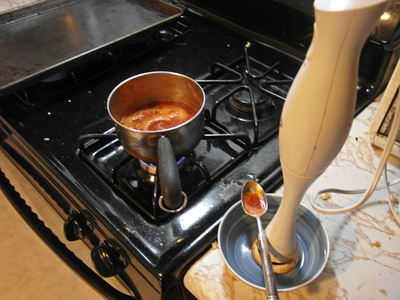 Use an immersion blender (regular blender works ok, too) and blend. Bring to boil and simmer. 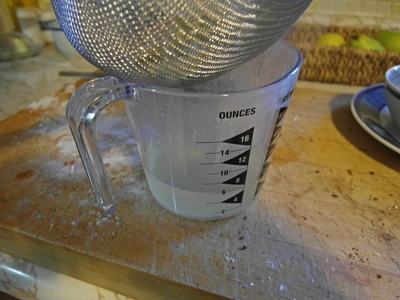 Add salt to taste (less than teaspoon for this recipe). 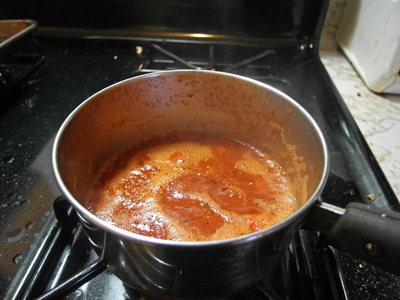 At this stage you can add in other spices if you want as well and keep tweaking the flavor. But keeping it simple tends to work best. Next time you see a jar of hot sauce, read the ingredient label. There are usually only about 4-5 ingredients total (just like this recipe! ).